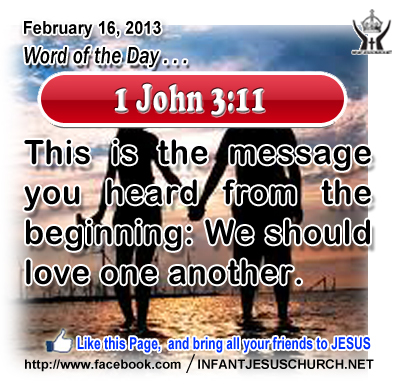 1 John 3:11: This is the message you heard from the beginning: We should love one another. Heavenly Father, Heavenly Father, we commit to you that w will intentionally show our love for your children in what we do and say. We do this trusting your grace to empower us to do more than we would do on our own. Through Infant Jesus our Savior we pray. Amen. 27After this he went out, and saw a tax collector, named Levi, sitting at the tax office; and he said to him, "Follow me." 28And he left everything, and rose and followed him. 29And Levi made him a great feast in his house; and there was a large company of tax collectors and others sitting at table with them. 30And the Pharisees and their scribes murmured against his disciples, saying, "Why do you eat and drink with tax collectors and sinners?" 31And Jesus answered them, "Those who are well have no need of a physician, but those who are sick; 32I have not come to call the righteous, but sinners to repentance. By “follow” Jesus meant not so much the movement of feet at the same time as of the heart, the carrying out of a way of life. For one who says that he lives in Jesus have to himself to walk just as he walked, not to aim at earthly things, not to follow perishable gains, but to flee base praise, to embrace readily the contempt of all that is worldly for the sake of heavenly glory, to do good to all, to impose injuries upon no one in bitterness, to suffer tolerantly those injuries that come to oneself, to ask God’s pardon for those who oppress, never to seek one’s own glory but always God’s, and to uphold whatever helps one love heavenly things. This is what is meant by following Jesus. In this way, ignore earthly gains, Matthew fond of himself to the band of followers of One who had no riches. For the Lord himself, who externally called Matthew by a word, inwardly bestowed upon him the gift of an unseen impulse so that he was able to follow. Are we ready to leave all for Jesus? Loving Infant Jesus, let us now come to you: Our hearts are cold; Lord, warm them with your unselfish love. Our hearts are sinful; cleanse them with your valuable blood. Our hearts are weak; make stronger them with your joyous Spirit. Our hearts are unfilled; fill them with your divine presence.